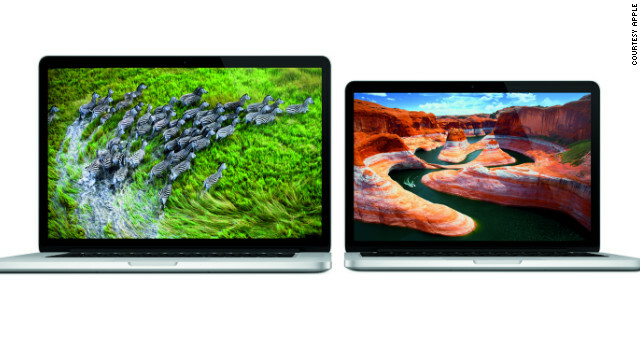 Apple says it's cutting the price of its 13-inch MacBook Pro with Retina Display by $200-$300, depending on storage. -- Apple on Wednesday said it would cut the price of its 13-inch MacBook Pro with Retina Display while simultaneously updating it with faster processors. The 15-inch model is also getting improved specs, although its price remains the same. The 13-inch Retina MacBook Pro now starts at $1,499 for 128GB of solid-state flash storage, and $1,699 for 256GB of storage. The higher-end model also includes a more robust 2.6GHz Intel Core i5 processor. The 15-inch model still starts at $2,199, but now that gets you a quad-core 2.4GHz Core i7 processor. If you want the best of the best, you can now get a 15-inch Retina MacBook Pro with a quad-core 2.7GHz Core i7 processor with 16GB of RAM for $2,799. In addition to the adjustments to the Retina MacBook Pro line, Apple also took the price of its 13-inch MacBook Air down a notch: The 13-inch model with 256GB of flash storage now costs $1,399. The new prices and specs are effective today, both online and in Apple Stores. The price cuts and speed bumps of the 13-inch Retina MacBook Pro make a lot of sense in the light of reviews, which praised the laptop's high-resolution 2,560 x 1,600 display, but lamented that it didn't have the same kind of power to drive those pixels as its larger 15-inch sibling. "What's inescapable is that this first version of the 13-inch Retina MacBook Pro isn't a winner when it comes to price and performance," wrote Mashable senior tech analyst Christina Warren in her review. "It's just a bit too expensive."